EDIT 1/9/19: Google renamed shortcuts to routines, so I updated the title of this article. If you're like me and have a non-techy spouse, you can appreciate technologies that are simple enough for him or her to use. Many years ago we stopped paying for TV and setup a Windows Media Center based DVR that records over-the-air shows. We use XBox 360's as extenders for each TV. It's awesome, but I'm using an old Windows 7 PC for the DVR, and even though it's dedicated to that task, it bogs down sometimes and needs a reboot. Enter TRIGGERcmd! So as you know, TRIGGERcmd can run any command on any computer that's connected to the Internet, including my DVR computer of course. I installed the TRIGGERcmd agent on that computer and I use the Reboot trigger to reboot it remotely. 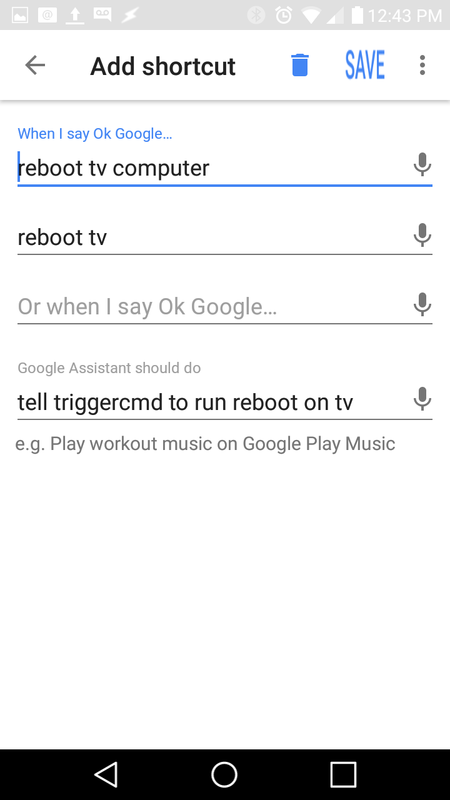 Today my wife was complaining about the TV, so I said, "Hey Google, tell TRIGGERcmd to run reboot on TV". That solved the problem, but I wanted her to be able to do that herself. I realized she's not going to remember to say that whole sentence, but if I let her pick some words she would remember, I can make a shortcut to associate her words with the "Tell TRIGGERcmd to run reboot on TV" sentence. As you can see in the screenshot below, she chose "reboot tv computer." I added "reboot tv" for myself, and maybe her if she likes it better. We'd have more options if she had a smart phone, but she still prefers what she calls a "dumb phone," so I can't give her an icon on her phone that triggers the reboot. I suppose I could give her a button to push on an old VCR remote control, but this is a decent solution. If she forgets she can say, "Hey Google, reboot tv computer," then I'll go to plan B. This screenshot is from the Google Home app (available on Android and iOS). You get to this screen with the Settings hamburger in the upper left, then ... More settings, then Shortcuts, then the + button in the lower right.